After this card resolves, each time your opponent adds a card(s) from their Deck or Graveyard to their hand this turn with a card effect, except by drawing them, you immediately draw 1 card for each card effect. You can only activate 1 "Shared Ride" per turn. 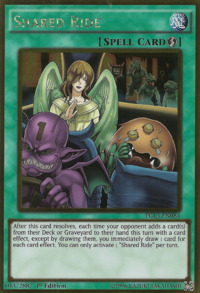 Sangan, the angel in the artwork of Graceful Charity, the monsters in the artwork of Tribe-Infecting Virus, and the red fiend in the artwork of Delinquent Duo appears in this card's artwork, showing the aftermath of the artwork of Tour Bus To Forbidden Realms. It has been established that the Bus is for monsters whose cards have been placed on the Forbidden List, and the scene suggests that the angel is trying to comfort Sangan, while one of the monsters from Tribe-Infecting Virus is confused about their present location. The fiend from Delinquent Duo is the bus driver. The events in this card's artwork continue on in Mistaken Arrest. The rather emotional reaction of Sangan to being on the bus may be a reference to how Sangan was often considered a Staple until it was Forbidden, as opposed to the other monsters who have been banned for considerably longer before this card's release. This card has a similar effect to “Maxx C”, only that card lets you draw when the opponent Special Summons instead. While the effect of "Shared Ride" is applying, if your opponent activates "Salvage", you will draw after "Salvage" resolves. Also, if your opponent activates "Beckoning Light" as Chain Link 2, then you will draw after "Beckoning Light" resolves the Chain Link 2, but before resolving the Chain Link 1.: If "Shared Ride" has been activated, when do you draw a card? While the effect of "Shared Ride" is applying, if your opponent activates "Salvage" and chains "Beckoning Light", you will draw 2 cards in total when each of these cards resolves. (You do not draw 1 card for each card added to the hand.) After "Beckoning Light" resolves as Chain Link 2, you will draw 1 card, and after "Salvage" resolves as Chain Link 1, you will draw the other card. : While the efect of "Shared Ride" is applying, if cards are added to the hand by multiple card effects, do I draw multiple cards? While the effect of "Shared Ride" is applying, if 2 or more cards are added to the hand from the Deck or Graveyard by a card like "Salvage" or "Preparation of Rites", you will only draw 1 card using the effect of "Shared Ride". (You do not draw 1 card for each card added to the hand. ): While the efect of "Shared Ride" is applying, if "Salvage" or "Preparation of Rites" is activated, do I draw multiple cards?